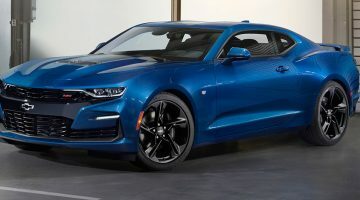 While most casual Chevrolet Camaro fans are probably familiar with the Z28 and SS, the ZL1 nameplate might be a little more foreign. Created in 1969 by General Motors’ Central Office Production Orders (or COPO for short), the original Camaro ZL1 was essentially the daddy of muscle cars. Equipped with an all-aluminum version of Chevy’s 427 cubic-inch V8, the ZL1 had a claimed horsepower rating of 430, but total output was apparently actually closer to the 500bhp mark. It was only offered during the 1969 model year, with a total of 69 cars built. The ZL1 option carried a price tag of $4,000, nearly double the price of a standard Camaro. Fast forward to 2012 and the ZL1 edition is back with a bang. At $66,600 it offers more horsepower for fewer bucks than any other car on sale today. The new King Camaro has been designed and engineered to not just recapture the muscle-car crown, but to own it. And, on paper, it looks like it’s done just that. A 0-100kph time of just 3.9secs and a top speed of 297kph are figures you’d normally associate with a supercar. As are an ability to pull a full 1.0g of lateral grip and dispatch a quarter-mile in 12 seconds dead. So, to find them in an off-the-peg muscle car is not just a surprise, but a shock. As you can imagine the ZL1 is packing a serious engine under the hood. The supercharged 6.2-litre V8 engine is shared with the Cadillac CTS-V, but here it has a reworked air intake and an active exhaust system borrowed from the Corvette ZR1. Everything touched by its power is modified from the standard Camaro, or unique in some way. Highlights include a beefed-up rear differential and CV joints, plus unequal-stiffness half-shafts to prevent wheel-hop under hard acceleration. The brakes are by Brembo, with six-piston calipers squeezing the two-piece front discs. All the aerodynamic changes on the ZL1 are functional, resulting in net downforce at speed. The centre bonnet bulge, made of carbonfibre, covers the top-mounted intercooler and also extracts air from behind the radiator and pulls it up and over the body. Underneath the car a flat belly-pan finishes in NACA ducts that direct air to cool the transmission. The front grille – reminiscent of the Transformers Bumblebee – hides brake-cooling ducts in the outer edges of its lower section. Meanwhile the tail receives a new bumper and a set of meaty quad exhausts. The twenty-inch, staggered wheels look good and are wrapped in super-sticky Goodyear Eagle F1 tyres. On the inside it is standard Camaro fare, meaning its interior is quite modern but over-plasticky. The overall feel is vastly improved though with the ZL1’s Suede Package which finishes the gearshifter, hand-brake, and steering wheel in grippy Alcantara. On the suspension front, the ZL1 comes with third-generation magnetorheological dampers (first seen on the Range Rover Evoque) with two driver-selectable settings. This latest iteration of the system uses two small coils instead of one large one to create the magnetic field that aligns and thickens the ferrous damping fluid, resulting in a faster field dispersal and better control. These new units react 1000 times per second, more than fast enough to stiffen up the car’s front end under braking.